Announcement Welcome! Sterling silver alternative engagement rings, wedding bands and promise rings. All handmade for the alt bride using gorgeous gemstones. Welcome! Sterling silver alternative engagement rings, wedding bands and promise rings. All handmade for the alt bride using gorgeous gemstones. 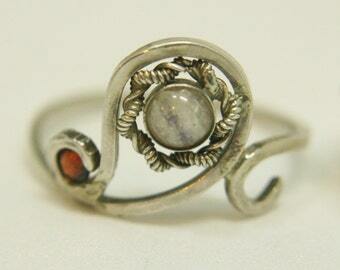 I recently made a copy of this labradorite ring for a lovely customer. I forgot how much detail it had The original is available in a US size 8. Testing out a new design. 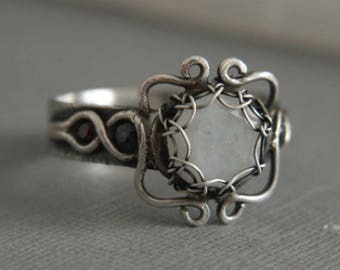 A wrapped solitaire ring with hearts either side of the stone. The white topaz ring is now available in 14k gold fill. I love working on custom creations, the more challenging the better. Sketches help me visualise the finished piece before I get started. Tarnishing and polishing up is my favourite part, when the finished piece can finally be revealed. This used to be a hobby that I ached to get back to whilst wasting my days behind an office desk; now, since leaving my job, I get to twist wire to my hearts content as a full time jewellery maker. I have a background in online marketing and design, but I've been making jewellery for the past 5 years and love manipulating wire to form unusual pieces. I'm forever sketching for new designs and have spent countless hours testing and perfecting techniques. Full time mother of one (so far), housewife, and jewellery maker.